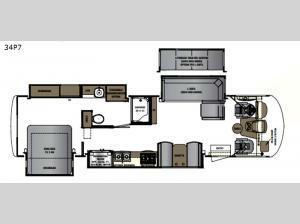 Imagine how you can travel the countryside with many comforts of home at your fingertips in this Georgetown 7 Series class A gas motor home. This 34P7 model offers plenty of space to move about thanks to the quad slide outs, plus plenty of seating to relax after traveling to your favorite RV park. Once you get to your destination, you can watch the 43" LED TV in the living room with a high definition home theater, or get cleaned up in the one-piece fiberglass molded shower with integrated seat and skylight, plus dual control shower facet with flex head. Maybe the cook can start washing the vegetables in the stainless steel farm sink while making dinner. You might even take a nap on the power tilt king bed. Come see what else you will love about this model. With any Forest River Georgetown 7 Series class A gas motor home you will find a color side and rear camera package providing safety driving down the road and parking your RV, the My RV "Smart Coach" premium package allowing you control of several features by using your cellphone, and a 7.0KW Onan generator to keep everything running the way you like it. Inside, you will love the look of the Shaw residential tongue and grove vinyl plank flooring, the Soft Touch Comfort furniture, and the stainless steel residential french door refrigerator with water and ice maker in the door, plus much more! Take a look and choose a model today!